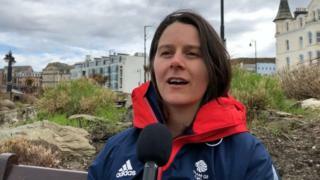 A British Olympian has backed a campaign to see a concrete skate park built in the south of the Isle of Man. Zoe Gillings-Brier, 32, became the first British snowboarder to appear at four Winter Games when she competed in Pyeongchang, South Korea in February. Gillings-Brier, who grew up locally, said: "A skate park in the south of the island would be absolutely awesome." The Jactor skate project, which would cost about £75,000, has met opposition from some Port St Mary residents. The town's commissioners will hold several drop-in sessions this week to encourage people to have their say and see plans for the proposed facility. Deputy Clerk Hayley Fargher said: "A few local residents are opposed and their concerns centre around noise and supervision. "But so many people are in favour, including the police who think it is a great idea. "We hope these sessions will be well-attended. They're an opportunity to listen to concerns and show what a positive impact such a facility would have on the town." The planned skate park would be built in addition to a existing play area. "You need stuff to do as a kid, as a teenager and even as an adult," said Gillings-Brier. "The more activities available, the more likely you are to get out of the house and get some exercise. "A skate park would be a great place to meet other people and have fun. I think genuinely that sporting facilities on the island are very good but more facilities in the south are badly needed." Having recently become a mum, she added: "I want my daughter to have access to as many sporting facilities as possible and that includes skateboarding." Gillings-Brier finished 15th at her first Winter Olympic Games in 2006, aged 20, eighth in 2010 and ninth in Sochi four years ago. In 2016, the International Olympic Committee (IOC) announced that skateboarding was amongst five new sports to be added to the 2020 Olympic Games in Tokyo alongside surfing. In February, Douglas Council announced it will build a new state-of-the-art £195,000 skate park in the town whilst Braddan Commissioners opened the island's first such facility in July 2016.